Bellator 214 this past weekend (Sat. January 26, 2019) was the mixed martial arts (MMA) promotion’s most successful event in a year. The show featured the finals of Bellator’s Heavyweight Grand Prix Tournament. 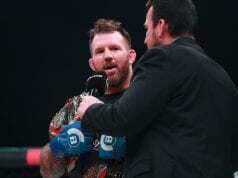 In the main event, light heavyweight champion Ryan Bader defeated Fedor Emelianenko via first-round knockout. With the victory, Bader is Bellator’s first-ever “champ champ.” Also, Aaron Pico co-main evented the card in his second-ever MMA loss. 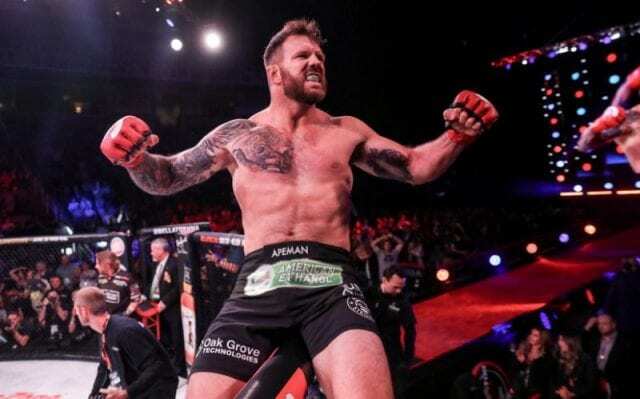 Former WWE star Jack Swagger (real name Jake Hager) made his MMA debut as well. Dave Meltzer of MMA Fighting is reporting that the show as a whole drew an average of 697,000 viewers. That’s Bellator’s best since January 20th last year, which was headlined by Chael Sonnen vs. Quinton “Rampage” Jackson. The main event between Bader and Fedor garnered 1.2 million viewers. Henry Corrales’ knockout victory over Pico saw 808,000 viewers. And of course, Swagger’s MMA debut was seen by 809,000. Bellator 214 was up against some tough competition Saturday night, namely the Golden State Warriors vs. Boston Celtics NBA game on ABC. The game was seen by a total of 4,290,000. Keith Thurman vs. Josesito Lopez on FOX’s Premier Boxing had 1,980,000 viewers. The NHL All-Star Game on NBC carried 1,778,000 viewers.